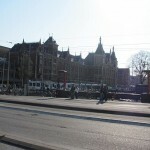 Amsterdam Centraal railway station is a little attraction in itself, used by 166.000 passengers a day. 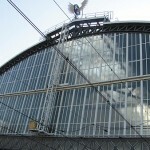 The station was designed by Pierre Cuypers and A. L. van Gendt, and opened in 1889. The station is built on three man-made islands, resting on 8,687 wooden piles which have been driven deep into the muddy and sandy soil. From the station it is possible to travel with trains in almost all directions in Europe. 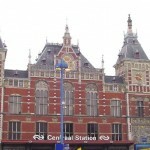 Three of four metro lines in Amsterdam terminate by the Centraal Station. If you want to live in a cheap hotel near the Railway Station, we recommend A Train Hotel.